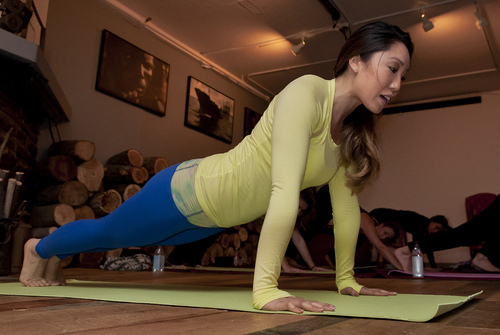 Excercise • Cassey Ho leads festival-goers through her stretching routines. Michael Mangum | Special to the Salt Lake Tribune Fitness instructor Cassey Ho leads a session of yogalates, a fusion of yoga and pilates, during a free event at the Youtube Lounge at the Sundance Film Festival in Park City on Saturday, January 18, 2014. Michael Mangum | Special to the Salt Lake Tribune Fitness instructor Cassey Ho leads a session of yogalates, a fusion of yoga and pilates, during a free event at the Youtube Lounge at the Sundance Film Festival in Park City on Saturday, January 18, 2014. Michael Mangum | Special to the Salt Lake Tribune Fitness instructor Cassey Ho leads a session of yogalates, a fusion of yoga and pilates, during a free event at the Youtube Lounge at the Sundance Film Festival in Park City on Saturday, January 18, 2014. Michael Mangum | Special to the Salt Lake Tribune Fitness instructor Cassey Ho leads a session of yogalates, a fusion of yoga and pilates, during a free event at the Youtube Lounge at the Sundance Film Festival in Park City on Saturday, January 18, 2014. Michael Mangum | Special to the Salt Lake Tribune Fitness instructor Cassey Ho leads a session of yogalates, a fusion of yoga and pilates, during a free event at the Youtube Lounge at the Sundance Film Festival in Park City on Saturday, January 18, 2014. Michael Mangum | Special to the Salt Lake Tribune Fitness instructor Cassey Ho leads a session of yogalates, a fusion of yoga and pilates, during a free event at the Youtube Lounge at the Sundance Film Festival in Park City on Saturday, January 18, 2014. Michael Mangum | Special to the Salt Lake Tribune Fitness instructor Cassey Ho leads a session of yogalates, a fusion of yoga and pilates, during a free event at the Youtube Lounge at the Sundance Film Festival in Park City on Saturday, January 18, 2014. Michael Mangum | Special to the Salt Lake Tribune Fitness instructor Cassey Ho leads a session of yogalates, a fusion of yoga and pilates, during a free event at the Youtube Lounge at the Sundance Film Festival in Park City on Saturday, January 18, 2014. Michael Mangum | Special to the Salt Lake Tribune Fitness instructor Cassey Ho leads a session of yogalates, a fusion of yoga and pilates, during a free event at the Youtube Lounge at the Sundance Film Festival in Park City on Saturday, January 18, 2014. Michael Mangum | Special to the Salt Lake Tribune Fitness instructor Cassey Ho leads a session of yogalates, a fusion of yoga and pilates, during a free event at the Youtube Lounge at the Sundance Film Festival in Park City on Saturday, January 18, 2014. Michael Mangum | Special to the Salt Lake Tribune Fitness instructor Cassey Ho leads a session of yogalates, a fusion of yoga and pilates, during a free event at the Youtube Lounge at the Sundance Film Festival in Park City on Saturday, January 18, 2014. Michael Mangum | Special to the Salt Lake Tribune Fitness instructor Cassey Ho leads a session of yogalates, a fusion of yoga and pilates, during a free event at the Youtube Lounge at the Sundance Film Festival in Park City on Saturday, January 18, 2014. Since uploading her first video on YouTube in 2009, Cassey Ho has reached more than 100 million views on her Blogilates channel, celebrated her first fitness DVD recently released in Target stores, and is preparing for a book release in the fall of this year. In recent mornings, she&apos;s been helping Sundance Film Festival-goers stretch their stresses away with her yogalates, a fusion of yoga and pilates, part of the activities at the YouTube venue at Root&apos;D (596 Main St.) in Park City. Dressed in bright blue yoga leggings, a pair of boots and a fitted leather jacket on a recent day, Ho was all smiles over her first experience at Sundance. The recently-turned-26-year-old  who celebrated the New Year by reaching 1 million channel subscribers  began using YouTube after graduating college. "I put up my first Pilates video for my real-life students who wanted to take a class on days when we weren&apos;t meeting," said Ho during a Salt Lake Tribune interview at YouTube&apos;s Sundance location. Her Internet fame began when viewers besides her real-life clients started watching her Pilates videos on YouTube. She soon received requests for workouts that targeted specific areas of the body from new channel subscribers. Excited by a growing fanbase, Ho responded to the requests. "To this day I still listen to my fans. If they want a certain video I give it to them and I really think it&apos;s about serving," she says. Ho says that another element of her success was through three months of dedicating 100 percent of her time to blogging, creating and uploading videos and, of course, responding to her fans. Now, she has gone beyond Blogilates to hosting Pop Pilates, a recurring in-person meet-up that allows 500 women to work out with her (the event is followed by autograph signing and picture-taking); running her own activewear line on shopblogilates.com, which features a colorful array of fitness wear and gear decorated with mottos like "train insane or remain the same"; and running her oGorgeous yoga bag line that, thanks to a feature in Shape magazine in 2010, is another contributing element to her successful career. The fitness guru&apos;s website blogilates.com offers recipes, fitness challenges and nutrition tips  all for free. Of all the aspects of her work, Ho says she is most excited by the ability YouTube has given her to be a part of people&apos;s lives around the world. When she meets fans and listens to their testimonials, she is inspired to offer even more to continue encouraging them to live healthful lives. "You meet girls who have lost 50 pounds, 100 pounds, just from doing my free online program  no personal trainers. It&apos;s just amazing. Other girls have suffered from anorexia or bulimia and for some reason they find a lot of inspiration and positivity through my videos so they said the videos have actually helped them get out of that. It&apos;s so nice to hear that people are taking charge of their own lives. To be able to inspire that is such an honor." Derek Callow, director of Global Partner Marketing, says part of YouTube&apos;s mission is to help artists like Ho accomplish their goals. "The amazing thing with her story and with many others is that a huge amount of views is coming from a global audience. We want to help creators who have got a story to tell and who have got great content find a global audience." Ho encourages artists to take advantage of YouTube. "A lot of the things I am doing now, I don&apos;t even know if they would be possible without YouTube," she says. "The exposure it has given me has been amazing. I think anyone who is looking to start a YouTube channel and is really scared, they should just do it  just put up a video. If you&apos;re going to be you and be real, then that&apos;s all you&apos;ve got. Give it a go and people will love you for it." The morning Sundance yoga series continues through Friday by Salt Lake City&apos;s Centered City yoga instructor Kim Dastrup and certified Forrest Yoga teacher Annastasia Kaessner. The classes are free and available first come, first served.